Investigators said it would take days to piece together the wreckage of the plane as history of vehicle comes under scrutiny. 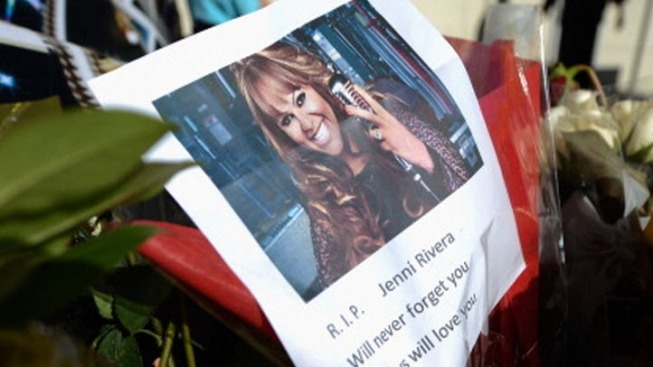 Mourners visit a makeshift memorial for Mexican-American singer Jenni Rivera at a Mexican radio station that is playing her songs continuously all day on December 10, 2012 in Burbank, California. Mexican authorities were performing DNA tests Tuesday on remains believed to belong to Mexican-American music superstar Jenni Rivera and six other people killed when her plane went down in northern Mexico. Authorities, meanwhile, began looking into the history of the plane's owner, Starwood Management of Las Vegas. Another of its planes was seized in September by the U.S. Drug Enforcement Administration in McAllen, Texas. The U.S. National Transportation Safety Board said it was sending a team to help investigate the crash of the Learjet 25, which disintegrated on impact Sunday with seven people aboard in rugged terrain in Nuevo Leon state in northern Mexico. Alejandro Argudin, of Mexico's civil aviation agency, said it would take at least 10 days to have a preliminary report on what happened to the plane. In an interview on Radio Formula, Argudin said Mexican investigators weren't sure yet if the Learjet had been equipped with flight data recorders. He also said there had been no emergency call from the plane before the crash. "She really inspired us as female Hispanics to move forward in life," said fan Rosie Sifuentes at a vigil in Lynwood, California. At Rivera's father's house in Lakewood, California, fans and neighbors walked up the driveway and hugged Pedro Rivera Jr., Jenni's brother. A distraught Pedro recalled his last conversation with his sister at church when they were taking a collection to buy Christmas toys for needy children. He said his sister gave him $5,000 to give to the children. "She said, 'I just want to see them smile. I just want to see them happy.' All she wanted was to see the happiness in people. And then she gave me a big hug. She said, 'I love you, brother.'" He said he was later watching television and wanted to send a text message to his sister to say that he loved her. "But I didn't because I thought maybe she's busy, maybe she's just barely getting out of singing or something ... You just regret those moments." Another brother, Juan Rivera, still held on to hope that his sister would be found alive. "In our eyes, we still have faith that my sister will be OK. We have no confirmation of her body being recovered, dead or alive," he told reporters. The California-born woman known as the "Diva de la Banda" died as her career peaked. She was perhaps the most successful female singer in grupero, a male-dominated Mexico regional style, and had branched out into acting and reality television. A 43-year-old mother of five children and grandmother of two, she was known for frank talk about her struggles to give a good life to her children despite a series of setbacks. She had recently filed for divorce from her third husband, former Major League Baseball player Esteban Loaiza. The plane was registered to Starwood Management of Las Vegas, according to FAA records, and was built in 1969. According to the National Transportation Safety Board, the twin-turbojet was substantially damaged in a 2005 landing mishap at Amarillo International Airport in Texas. It hit a runway distance marker after losing directional control. There were four aboard but no injuries. It was registered to a company in Houston, Texas, as the time. The company is also subject of a federal lawsuit in Nevada. QBE Insurance Corp. alleges that a Starwood aircraft was ordered seized by the DEA when it landed in McAllen, Texas, from Mexico on Sept. 12. The New York-based insurer sued in October to rescind coverage for the Hawker 700 jet. There have been several high-profile crashes involving Learjets, known as swift, longer-distance passenger aircraft popular with corporate executives, entertainers and government officials. A Learjet carrying pro-golfer Payne Stewart and five others crashed in northeastern South Dakota in 1999. Investigators said the plane lost cabin pressure and all on board died after losing consciousness for lack of oxygen. Former Blink 182 drummer Travis Barker was severely injured in a 2008 Learjet crash in South Carolina that killed four people. That same year, a Learjet slammed into rush-hour traffic in a Mexico City neighborhood, killing Interior Secretary Juan Camilo Mourino and eight others on the plane, plus five people on the ground.